The MFT1800 series is a range of 3 instruments for testing low voltage electrical installations to the requirements of all IEC 60364 derived standards. They provide all the tests required to complete the necessary electrical certification for industrial, commercial and domestic fixed wiring installations. MFT1815 – The entry level tester offering CAT IV safety, 200 mA continuity, 2-wire non trip loop testing with resistance and fault current display, frequency measurement and the largest, brightest and clearest display on the market. MFT1825 – The most popular of the range of testers offering all the benefits of the MFT1815, plus 3-pole and 2-pole earth electrode testing, 15 mA continuity testing, auto RCD testing, phase rotation, programmable and 3-phase RCD testing and current measurement with the optional clamp. 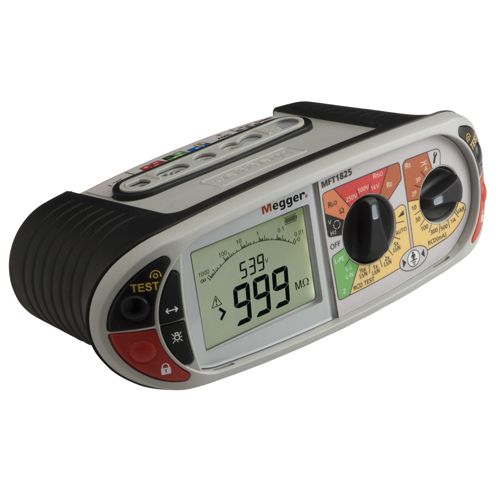 MFT1835 – The most sophisticated of the installation testers brings Type B RCD testing, 3-pole earth electrode testing with attached rod technique and stakeless testing to a downloading and rechargeable instrument.